While I’m busy with work and feel like I’m about to drop dead every evening when I get home, I haven’t had the energy for anything really deep or insightful lately. I hope you’ll forgive me. Instead, I thought I’d just post a couple of panels that are more in the goofy and weird category. Way back some forty years ago, when Stan Lee was still scripting too many books every month, it apparently seemed like a good idea to do some body swapping. And as far as the body swapping went, it must have seemed like a good idea to have the Man Without Fear switch bodies with a certain megalomaniac Latverian dictator. Daredevil #37 and #38 were part of a cross-over with the Fantastic Four which, though enjoyable in its inherent quirkiness, suffered from illogical plot points galore. 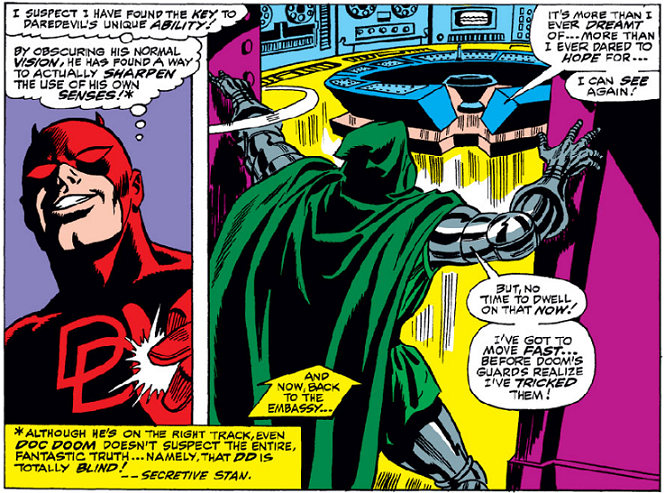 The last page of Daredevil #37 saw the actual body switch and us readers were forced to marvel at the fact that Matt, suddenly occupying the body of Victor von Doom, would be more surprised by seeing his hands “encased in metal gloves!” than the fact that he’s actually seeing them. This slight goof seems to have occurred to Stan between issues, so he makes sure to make up for it in the next issue. 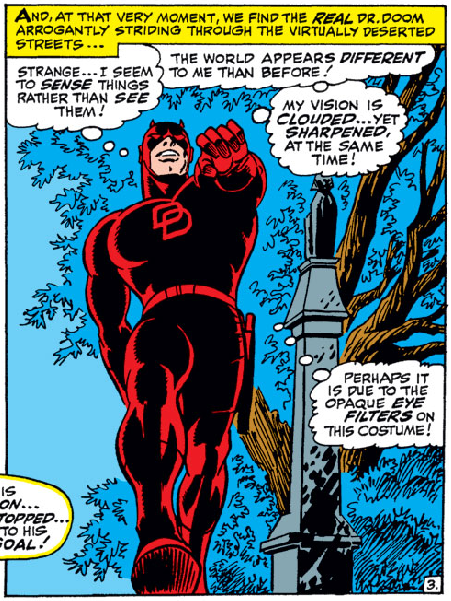 Doom himself, however, now walking around in Daredevil’s body and costume, seems a little dense, offering the following psedo-scientific explanation for his altered perceptions. Isn’t this guy supposed to be a genius? I’m going to go hit the sack, you guys take care. For more on these issues, check out the summaries available on The Matt Murdock Chronicles.